An emergency is not a positive term but it is definitely a critical situation which demands fast response and appropriate aid. Perhaps it is one of those situations where people are exposed to life-threatening circumstances and they expect external help. Over the years, humanists and support organizations have pondered over the question on how to make people aware of such situations. Now they all agree that custom emergency services magnets help to raise awareness about emergencies and they can inspire apt and quick response from bystanders. Situational and medical emergencies occur every minute of a day and very few people know how to tackle them. 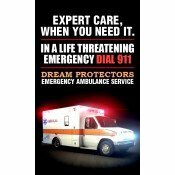 Every year, millions of people die in America and Canada without receiving emergency care aids. It is difficult to prevent emergencies but it is easier to prepare people to face such critical situations with appropriate behavior. Although many emergency services have adopted technological help to raise awareness on emergency services behavior. However, it is not enough because many people do not have access to modern technology and they often rely on an external support system to know their behavior under such situations. 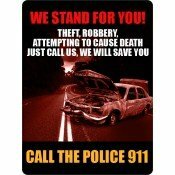 Custom emergency contact magnets for fridge and car are perfect to raise awareness about such situations. 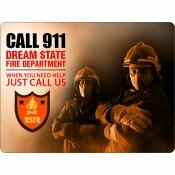 Customized emergency services refrigerator magnets are a great gift choice year round because everyone will love them. People only have to look at their refrigerator doors or cabinets to know who they should approach to get help during emergencies. These customized magnets are treasured in homes as a reference and they may never have a bad day. 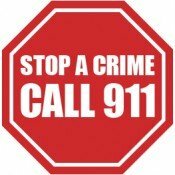 Emergency services outdoor magnets can be used over vehicles of emergency services to raise public awareness. Large car magnets easily buy attention and people will stop at streets, traffic squares or junctions and will be able to see the information that is needed during emergencies. This selection of custom emergency services magnets features police magnets, ambulance magnets, dial 911 magnets and fire department magnets. This categorization is expected to expand to include more services in the coming years. We also encourage other emergency services to approach us with their requirements. We offer excellent savings on huge orders of these customized refrigerator and car magnets. On each order, we offer art setup and online design proof for FREE. We also offer free ground shipping anywhere within the contiguous USA. Apart from that, clients can opt for Standard Overnight Shipping and FedEXday shipping at a slightly higher cost. To know more about customization, shipping or distribution in any of these customized emergency magnets, call us at 855-762-4638 (Toll Free) or write to us at info@CMagnets.com.